A recording of the session will be made available online. 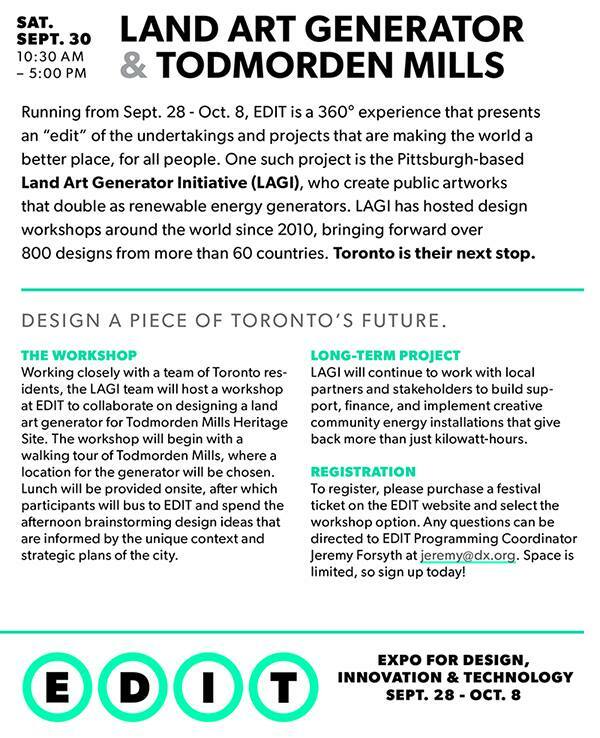 Want to be a part of designing Toronto's clean energy future? LAGI will be giving a full day workshop at EDIT: Expo for Design, Innovation & Technology. Join us on Saturday, September 30 2017 at EDIT: Expo for Design, Innovation & Technology. See http://editdx.org/events/workshops for more information. Chatham University is hosting a Land Art Generator Initiative exhibition this autumn at the Art Gallery in Woodland Hall on the Shadyside campus. Please join us at the reception on October 13th. You don't have to wait until the reception to see the show. The gallery will be open to visit during normal hours during the fall semester. Energy infrastructure of the past, like oil refineries and rigs, aren’t typically considered to be beautiful. But as the world transitions towards renewable energy, what if utilities could double as art installations? That’s the dream pursued by the Land Art Generator Initiative (LAGI), which holds a design competition every two years to present visions for energy-generating artworks able to power hundreds of homes. 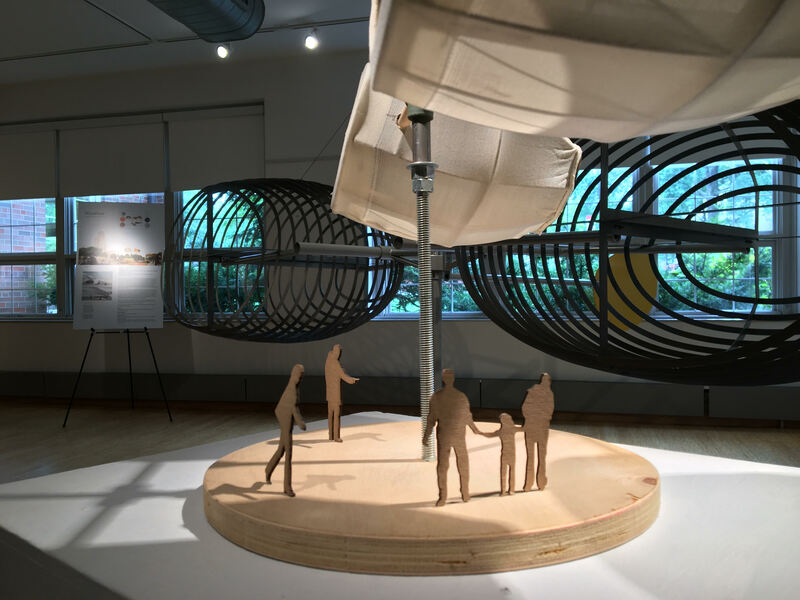 2016’s winners included ethereal sailboats that harvested wind for power and fog for water, and a whale-inspired design that generates wind, solar, and wave energy. LAGI just announced the location for their 2018 competition: Melbourne, Australia. One of the world’s most followed sustainable design events, the Land Art Generator Initiative (LAGI), has announced that its next international design competition will be sited in Melbourne. Run in partnership with the Victorian government’s Department of Environment, Land, Water and Planning, the competition will be open to artists, designers, architects, landscape architects, scientists, engineers and others to submit proposals for large-scale, site-specific public art installations that are capable of generating clean energy for a site in Melbourne. Founded in Pittsburgh by artist Elizabeth Monoian and her architect husband Robert Ferry, the LAGI’s goal is to accelerate the transition to post-carbon economies by providing “models of renewable energy infrastructure that add value to public space, inspire, and educate,” as well as providing equitable power to thousands of homes around the world. The initiative has staged four competitions since 2010, with sites in the United Arab Emirates, Freshkills Park in New York, Copenhagen and Southern California. The Melbourne design brief is currently being drafted with local partners to align with the strategic plans and cultural context of the site, the city, and the region. The competition will be launched in January 2018 with submissions due in May 2018. "Under the slogan “Renewable energy can be beautiful,” the Land Art Generator Initiative (LAGI) has showcased more than 800 innovative designs from countries ranging from India to the United States since its inception in 2010. While fostering creativity, the initiative also contributes to raise awareness on renewable energy as a way to meet the central goal of the Paris Agreement, which is to hold the global average temperature rise to as close as possible to 1.5°C." The Land Art Generator Initiative would like to see a world in which the aesthetic influence of clean energy technologies has been intentionally designed to be a reflection of our culture. Working with cities and communities around the world LAGI is bringing forward site-specific solutions for renewable energy infrastructure that is designed as public art. In doing so, we are shifting from the “gloom and doom” narrative of climate change to inspiring examples of the beauty of our sustainable future, showing policy makers and city planners that net-positive energy installations can be placemaking tools, economic development drivers, and educational venues while they help to power the grid. These are the questions asked by Tereneh Mosley, the founder of Idia'Dega, when she learned of the electrification needs of her Maasai collaborators in Olorgesailie, Kenya. She reached out to LAGI in 2015, and less than six months later a participatory design workshop in Kenya led to the founding of Maasai Solar. Attendees to this presentation will learn about creative ways of integrating renewable energy infrastructure within specific cultural contexts. 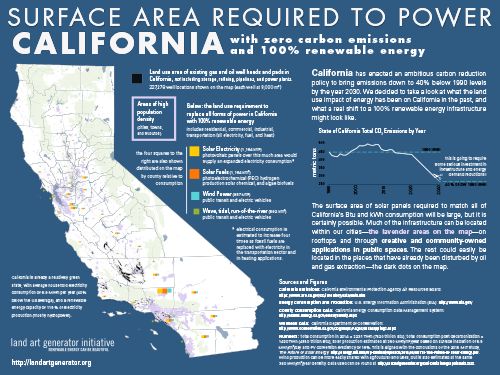 How can we get past the not-in-my-backyard response that so often comes with proposals for clean energy generation near culturally-sensitive and unique places? Can design create a win-win scenario for people and the planet? What are the natural sources of energy in your community, culture, country – how might that shape your renewable energy solutions? Tereneh Mosley will talk about the work of LAGI and the Maasai Solar collaboration of LAGI + OMWA: Olorgesailie Maasai Women Artisans of Kenya + Idia'Dega. Attendees will take part in an interactive sessions brainstorming and designing their own ideas for how to bring solar and wind power to the contexts of their communities so that our energy landscapes and accessories are an integral part of our cultural heritage. 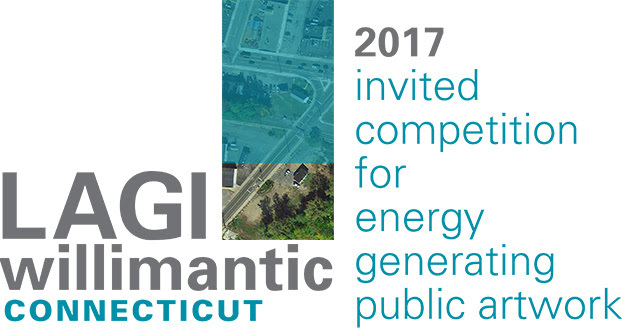 On March 3, 2017, the Institute for Sustainable Energy (ISE) at Eastern Connecticut State University and the Connecticut Department of Economic and Community Development (DECD) Office of the Arts hosted the Land Art Generator Initiative for a workshop in Willimantic. 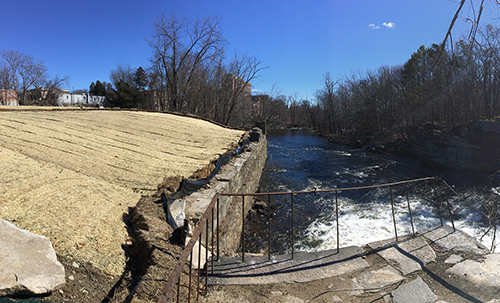 Willimantic Whitewater Partnership (WWP) has recently remediated a prominent site in the heart of Willimantic, Connecticut and prepared it for development. Soon it will be home to a new whitewater park and other public amenities that WWP would like to power with on-site renewable energy. LAGI is working with WWP in partnership with the Institute for Sustainable Energy (ISE) at Eastern Connecticut State University and the Connecticut Department of Economic and Community Development (DECD) Office of the Arts. Together we will be launching an invited design competition to bring forward the best ideas for how to utilize the parcel to generate clean energy while contributing to the creativity and beauty of the development. 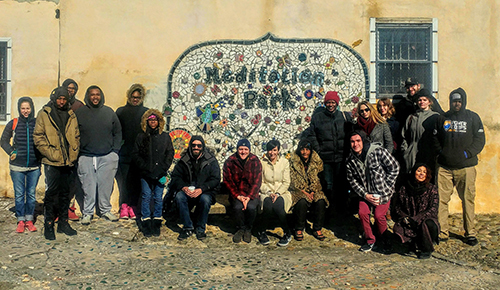 On April 6, 2017, the Local Initiatives Support Corporation (LISC) hosted the Land Art Generator Initiative for a workshop in San Antonio in partnership with the Land Heritage Institute, LiftFund, and AIA San Antonio. 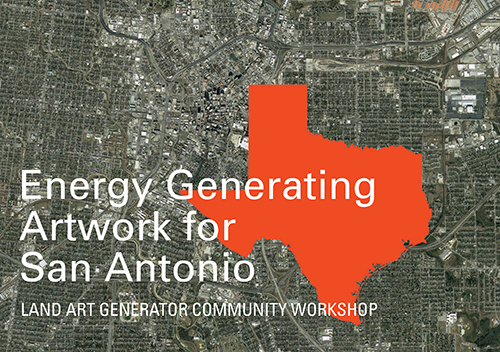 During the day long workshop, community members investigated how renewable energy technologies can be incorporated into public art and creative placemaking opportunities around San Antonio. The event was an open forum for the exchange of ideas within a variety of contexts to address multifaceted issues around the environment and social equity through a design lens, and without constraints on individual creativity. Over the next decade as San Antonio continues to build on its rich cultural heritage through exciting developments around the city, it will be important to maintain a focus on how the outcomes of economic growth will bring benefits to everyone and not only to those who live in more affluent districts. It will also be important to consider the environment and incorporate sustainable infrastructures for energy, water, and food. Perhaps there are opportunities to bring site specific design solutions to key sites around San Antonio that can proactively address these issues and serve as an example and catalyst for equitable development throughout the region. This is the challenge that the participants in the workshop set out to solve with artful and creative proposals for speculative design interventions in public space. The discussion brought out many ideas for potential applications in San Antonio, including vacant lots, the Mission Reach, and major development projects where a public art component could also add to sustainable development goals by generating clean energy on site. Conversation pointed to how such projects could involve the school systems to invigorate science, technology, engineering, and math education by inspiring creativity and supporting STEM to STEAM initiatives. Sites could serve as destination field trips for learning about closed-loop systems, sustainable technologies, ecology, and biomimicry. The Land Art Generator Initiative will be facilitating a community art workshop in Yakima, Washington! 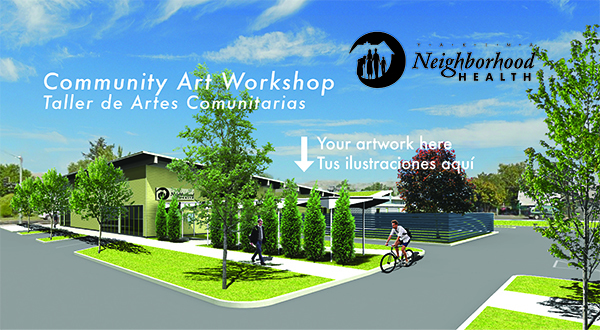 Come share your stories about the neighborhood, draw your vision for a mural, and be creative! Your ideas will be incorporated by local artists Cheryl LaFlamme and Richard Nicksic as they design a mural that incorporates beautifully colored solar technology to grace the exterior of the building formerly known as Roy’s Market. The building is being renovated into a beautifully landscaped and environmentally friendly apartment complex with a café and laundromat. All designs from the workshop will be displayed in a special exhibit inside the building soon after it opens. Community members of all ages are invited to this unique event. We supply the materials and you bring your ideas! ¡Venga a compartir sus historias sobre el barrio, dibuje su visión para un mural, y sea creativo! Sus ideas serán incorporadas por un artista local que diseñan un mural que incorpora tecnología solar de colores brillantes para adornar el exterior del edificio anteriormente conocido como Roy’s Market. El edificio está siendo renovado en un complejo de apartamentos muy bien cuidada y respetuosa con el medio ambiente con una cafetería y lavandería. Todos los diseños del taller se mostrarán en una exposición especial dentro del edificio poco después de su apertura. "For the past six years, Godfrey has had her students participate in the biennial competition held by the Land Art Generator Initiative (LAGI). This year, two of her graduate landscape architecture students, Keegan Oneal, Student Affiliate ASLA, and Colin Poranski, took second place. LAGI was founded by Robert Ferry and Elizabeth Monoian in 2008 to inspire new forms for alternative energy generation. Competition sites have included Copenhagen, Denmark; New York City; and Abu Dhabi, United Arab Emirates. This year, the competition site was 2,000 feet off the shore of Santa Monica, California. It was the first time LAGI had selected an offshore site, and it raised the bar for aesthetic considerations considerably. Despite the absence of any literal backyards, there is little more fraught territory than nearshore environments, especially in affluent areas like Santa Monica. The Atlantic and Pacific Oceans have long served as unique magnets for contemplation and artistic interpretation within American culture, and coastal areas are, statistically speaking, scarce: While the United States has 3.8 million square miles of land, it has just 95,471 miles of shoreline." The future of energy has arrived in Pennsylvania and we ought to push it forward. The day before President Donald Trump was inaugurated, a team installed solar panels on our roof that will offset 100 percent of our home’s electricity. We live in one of the densest neighborhoods in Pittsburgh in a 20-foot wide row house on the North Side. The timing of the installation worked out to be inauguration eve by chance, but it made us reflect on the fact that this is one of the easiest actions that we can take as Americans to help both country and ourselves — whether we are concerned about the climate and that the Trump administration might lock in a few additional degrees of global temperature rise, or whether we are interested in being grid-independent and saving money. The winds of populism are rolling in on both sides of the political spectrum. This was made clear with the popularity of the Donald Trump and Bernie Sanders presidential campaigns. Populism appeals to ordinary people, and we can’t think of an issue that is more popular than renewable energy. A post-election survey conducted by the Conservative Energy Network found that more than 70 percent of voters, regardless of party, favor placing more emphasis on solar and wind power than on coal. Even base GOP voters favor wind and solar over coal. In many markets, solar already has surpassed all other forms of energy generation and become the cheapest per kilowatt-hour. Unless government puts its finger on the scale, we can see the end of coal as an electrical power source. For those who understand the science of climate change, this is good news. And for those who doubt the science, it is still good news because it means cheaper power, more resilient infrastructure, less air pollution, fewer lopped-off mountaintops, lower risk to our riversheds and natural habitats, and increased independence from a not-always reliable electricity grid. So, call up a solar company today and put those panels on your roof! You might not need to spend a dime to do it. You likely can arrange a purchase agreement by which you lease your roof and buy back the energy — while saving money on your electric bill. Call your state representatives and municipal officials, too. Tell them to support market-based approaches, such as the Property Assessed Clean Energy Program (PACE), to kick-start the clean-energy economy and create jobs. Tell them to support efforts to require that Renewable Energy Credits used in Pennsylvania are generated in Pennsylvania through the production of clean energy. And promote community projects in your own neighborhood to produce more renewable energy. There are hundreds of thousands of rooftops and vacant lots in Pennsylvania that represent ripe opportunities for generating power. With the cost of installed solar panels at less than $4 per watt and falling, there is no reason to delay. In the hands of artists and designers, the use of vacant lots for community solar can also become opportunities to create public art with new types of solar panels, which now come in almost any color. Let's catch up to states such as New York, where the Reforming the Energy Vision plan is reducing market barriers to clean-energy infrastructure and where a statewide Green Bank is increasing the availability of capital for energy projects. Remind your representatives that, in Pennsylvania, jobs in the clean-energy sector outnumber those in coal, gas and petroleum combined by nearly 2 to 1, and that jobs in renewable energy will be tripling in the next decade worldwide. Western Pennsylvania has a tradition of being at the leading edge of energy innovation, from Titusville to Westinghouse and the Marcellus Shale. Let’s recognize that the sun is setting on those old technologies. Let’s move to the front edge of the 21st century. On February 3rd and 4th, 2017, LAGI was in Philadelphia to give a talk at Temple and facilitate a design workshop with the Village of Arts and Humanities in North Philadelphia. Read more about the events on our blog: Imagining Solar Art at the Village of Arts and Humanities Philadelphia. 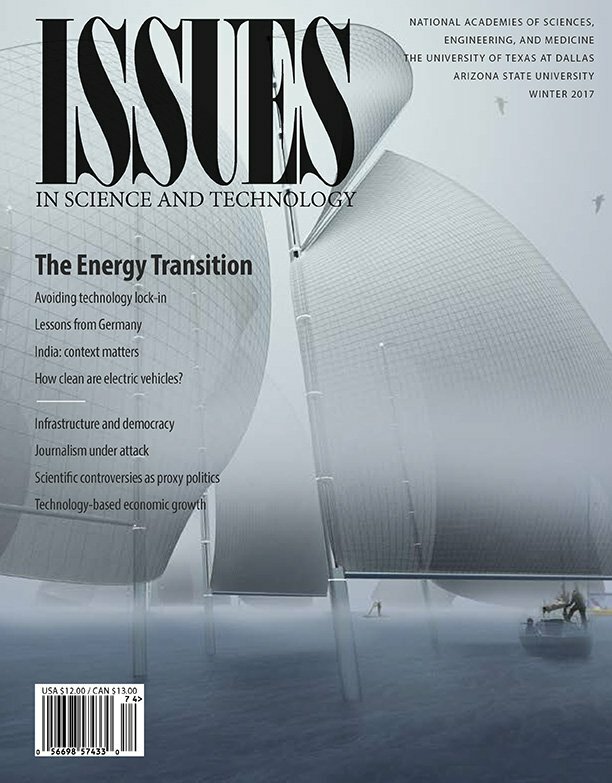 LAGI 2016 submissions for Santa Monica are featured on the cover and inside of the Winter 2017 edition of Issues in Science and Technology. Visit the historic Santa Monica Pier at low tide and near the horizon you’ll see the eroded remnants of a nearly century-old breakwater seawall peeking up through the waves. Once a protective barrier for a long-lost marina, it’s now the site of the fourth Land Art Generator Initiative design competition. 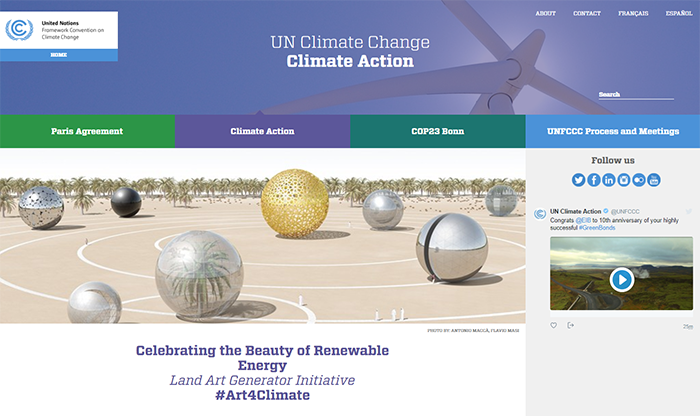 The Land Art Generator Initiative implements the design and construction of new landmarks of civic art for the twenty-first century that give back to communities by providing clean and renewable infrastructure solutions, while educating and inspiring people about the beauty of our postcarbon future. LAGI Santa Monica invited creatives around the world to imagine regenerative artworks that harvest millions of liters of drinking water and enough electricity to power thousands of homes in Southern California. Following insightful essays on ecological art, spatial justice, and the history of power and water in Southern California, sixty-six of the LAGI Santa Monica competition entries are profiled in this book through detailed spreads that include renderings, illustrations, and diagrams. The result is an astounding sampling of innovative and artistic solutions that employ the latest wave, tidal, wind, solar, and water-harvesting technologies, and that have resonance for coastal cities around the world. An exhibition of LAGI’s collaborations with ecoartscotland and other organisations will be shown at the Innovation Centre, University of Exeter from 16 January to 28 April. The Nick Reeves AWEinspiring Award is presented annually by CIWEM's Arts and the Environment Network in association with the Centre for Contemporary Art and the Natural World (CCANW). The award celebrates projects or practitioners who have contributed innovatively to CIWEM's vision of "putting creativity at the heart of environmental policy and action". The 2016 judging panel consisted of representatives from CIWEM's Arts and the Environment Network and CCANW. Special Commendations were also awarded to Tania Kovats for her exhibition ‘Evaporation’ and Chris Watson for his work as a musician, documentarist, communicator and sonic artist. "LAGI Glasgow shows how every development can approach early stages of master planning by recognising the natural energy resources that exist within the site (most commonly in the form of sun, wind, and ground/water source heat) and translating them creatively into features that can offset or reduce the need for externalised energy sources, all the while celebrating these climate solutions by making them attractive and engaging places for people." "Once a hub for heavy industry, the site known as Dundas Hill in Port Dundas, less than two miles from Glasgow city centre, still retains hallmarks of a manufacturing neighborhood. While the canals and locks surrounding the area are rarely used today, the architecture of a bygone age remains prominent – warehouses, factories and defunct chimneys dot the landscape, severed from the rest of the city by M8 motorway. However, behind these fading facades, a new breed of eager Glaswegian makers are breathing life back into the area, building upon its heritage. Inside the Whisky Bond – a co-working space established on the site of a former distillery – artists and makers can take advantage of 3D printers and CNC machines to create their craft, while digital agencies and graphic designers rent offices in the upper floors. Up the road, at the Glue Factory, independent artists and performers showcase their latest creations in another former industrial site. Currently empty spaces surrounding the north Canal and Speirs Wharf are in negotiation to be redeveloped as student housing and, on an unassuming brownfield site, where another former whisky distillery once lay, Glasgow is soon to be home to the Wind Forest – a public art project comprised of 100 stem-like structures which are in fact bladeless wind turbines. The winning design of a year-long competition by Land Art Generator Initiative’s (LAGI) Glasgow chapter, in collaboration with EcoArtsScotland, the Wind Forest will be implemented as part of the Glasgow Canal Regeneration Partnership – a private-public-partnership designed to revitalize the area within which Dundas Hill falls, and largely the catalyst behind the larger area’s recent resurgence as a creative hub.Founded in 2010, LAGI’s main aim is to inspire clean energy generation through aesthetically pleasing installations, proving that art and engineering professionals can not only coexist, but co-create innovatively. “Art is a way to confront ecological problems,” says LAGI co-founder Robert Ferry, stating that he and his founding partner were inspired by American land art and how infrastructure can . “Science has always been grappling with a communication problem. Art in public spaces can solve that. It lets people run into ideas they weren’t planning to think about.”"
"Every two years, the Land Art Generator Initiative international design competition provides an opportunity for creative minds around the world to reflect on the nature of energy infrastructures and what they can aspire to be in their built form. How can they integrate themselves into our cities in ways that enhance public space, educate, and inspire? The 2016 design site offered participating teams the opportunity to utilize wave and tidal energies as well as wind, solar, and other renewable energy technologies." 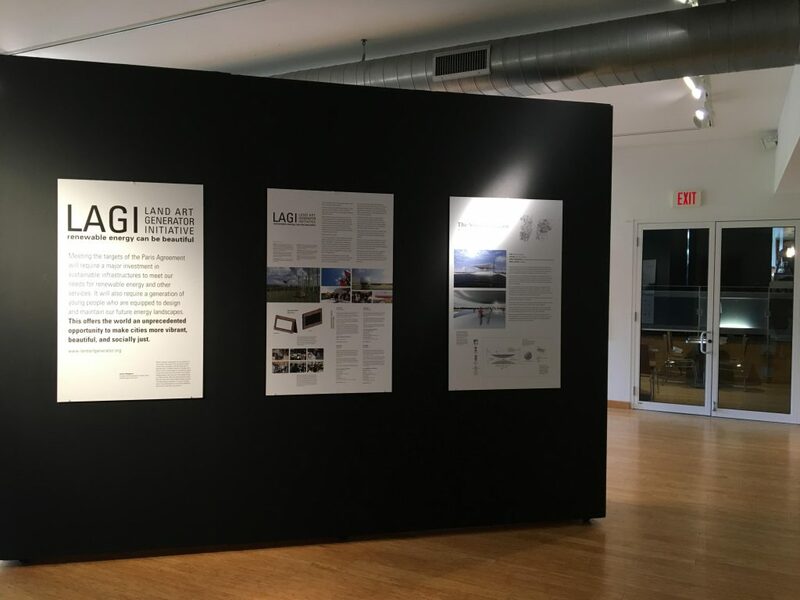 "Since 2010, the Land Art Generator Initiative (LAGI) has sponsored site-specific design competitions, soliciting ideas for public art that generates clean power. Its 2016 contest was the most ambitious yet. It called on designers to conceive of art installations that generate both clean power and water for the city of Santa Monica, California. Here we present highlights from the competition. 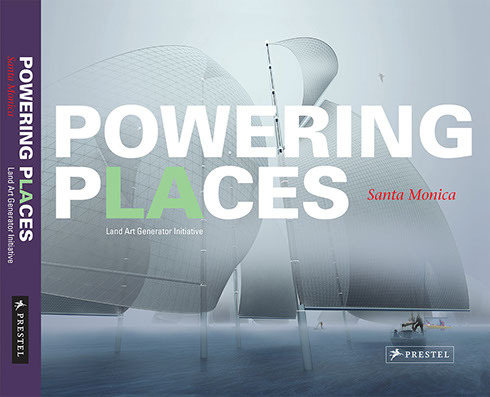 Learn more about the contest and the entries here and in Powering Places: Land Art Generator Initiative, Santa Monica." If you're in Southern California, tune in to 89.3 FM at 10 a.m. on October 6 to hear LAGI Directors, Elizabeth Monoian and Robert Ferry, talk about the LAGI 2016 winners on Take Two with co-host Alex Cohen. Regatta H2O, as the sculpture is called, is the winner of a contest sponsored by The Land Art Generator Initiative (LAGI), an organization whose goal is to “accelerate the transition to post-carbon economies by providing models of renewable energy infrastructure that add value to public space, inspire, and educate.” Since 2010, they’ve been hosting a biannual contest for artists to create public art that’s beautiful and generates green energy. Previous years have seen the contest in places like Dubai and Copenhagen; this year’s was held in Santa Monica, California, a part of the world deeply affected by climate change-driven drought. Elizabeth Monoian and Robert Ferry, LAGI’s founders, say Regatta H2O, from Tokyo-based designers Christopher Sjoberg and Ryo Saito, stood out above the pack for using the “specific contextual features” of its Santa Monica Bay site in its design. "Romanian architect Alexandru Predenu aims to supply fresh water and locally grown food to Santa Monica with an exciting new aeroponic farm and seawater desalination plant combination. Yes, there’s an abundance of fresh food available in California, the warm climate is perfect for year around crops. However, most of it is grown using water-hungry conventional farming methods. Obviously, in a drought-stricken state with a naturally dry climate, major changes are needed. Especially when agriculture is responsible for 80% of the water usage. The Ring Garden offers some interesting solutions. A finalist of the 2016 Land Art Generator Initiative competition, Predenu’s design marries sustainable food production with a renewable source of drinking water for the City of Santa Monica. But it’s bigger than that. The aeroponic farm produces food for humans, farm animals, and it’s own energy… simultaneously. All of the structure’s functions run on solar power through photovoltaic panel collection, and energy created in algae bioreactors. It also harvests CO2." "If we told you a power plant was being built off the coast of Santa Monica, mere yards from the Santa Monica Pier, you'd think Santa Monica leaders had lost their minds. But what if that power plant was also designed as a public art piece? That’s the goal of the 2016 Land Art Generator Initiative, says the Santa Monica Lookout. The competition not only puts a focus on creating new forms of sustainable energy, it also challenges designers to add some artistry to the normally drab and foreboding appearance of power plants." The article includes more information from an interview with Aziz Khalili, one of the engineers on the design team along with Puya Kalili, Laleh Javaheri, Iman Khalili, and Kathy Kiany (Khalili Engineers). 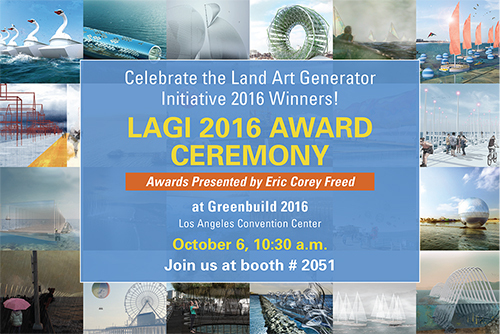 Please join us for the 2016 Land Art Generator Initiative Design Competition Award Ceremony! For the duration of the expo days, an exhibition of the entire LAGI 2016 shortlist will be on display in the EXPO HALL (October 5–6). Thanks to the LA chapter of the US Green Building Council! Join us at the Annenberg Community Beach House in Santa Monica for the LAGI 2016 exhibition. *Please RSVP by registering for FREE at the Eventbrite Page. The event will include a roundtable discussion about our future energy and water infrastructures. The panel will including Dean Kubani (Santa Monica's Chief Sustainability Officer), Rebecca Ehemann (the founder of Green Public Art), Barry Lehrman (Cal Poly Pomina Asst. Professor of Landscape Architecture), and the LAGI directors, Elizabeth Monoian and Robert Ferry.